L Hollier, S Stal. Calcium Phosphate Cement Cranioplasty: Clinical and Radiographic Follow-up. The Internet Journal of Plastic Surgery. 2003 Volume 2 Number 1. The use of hydroxyapatite cements to replace bone deficits has entered widespread practice in craniofacial surgery. Although these substances have been shown to be at least partially replaced by bone in some experimental models, their long-term outcome in human cranial replacement or augmentation is not known. This study evaluated eight patients who had undergone cranioplasty using a hydroxyapatite cement. The cement was used in both inlay and onlay fashion. The mean follow-up interval was nineteen months and ranged from eight months to twenty-seven months. All patients underwent repeat CT scanning at the time of latest follow-up. Only one significant complication was noted, consisting of a postoperative persistent seroma that was resistant to repeat needle aspiration and required open drainage and removal of the material. CT scans revealed variable resorption of the cement in three cases. In the two cases in which the material was used primarily as an inlay, significant fragmentation of the material was seen. The appearance of the junction of the cement and the native bone was variable. While in some cases this interface could not be distinguished, in other areas it was seen as a distinct lucency. Although clinically minor asymmetries were noted in the appearance of the cranial vault and forehead, no patient was felt to be in need of revisional surgery. Even in areas of fragmentation, the reconstructions felt solid without evidence of mobility. No patient developed an infection or extruded the material. This study, though not providing histologic evidence, does seem to indicate that bone cements are well tolerated but are not always successfully firmly incorporated into the host bone. Hydroxyapatite is the primary mineral component of bone, and is composed of interconnected calcium phosphate molecules (Ca10(PO4)6(OH2) (1,2,3). In the past, hydroxyapatite implants were primarily in the ceramic form (2). These ceramic implants are created in a process known as sintering, in which the calcium phosphate is heated at very high temperatures (3). Although such ceramic implants can be manufactured in any of a variety of shapes, intraoperative shaping is limited to reducing the size of the implant by burring. Consequently, nonceramic forms of hydroxyapatite have been developed. Rather than require heating for the crystallization process, these products crystallize when mixed with an aqueous solution, most commonly containing phosphate (2,3). As the implant crystallizes, it takes on a putty-like consistency and can be contoured to any defect. Typically, within ten to fifteen minutes, the implant completes the process and hardens, securing its position within the defect. An issue with these implants is their porosity. Pores of 100 micron diameter are thought to be necessary for bone ingrowth (3). These nonceramic forms of hydroxyapatite are typically microporous, limiting bone ingrowth. Although porous forms of hydroxyapatite have demonstrated significant evidence of bone ingrowth when placed in inlay fashion (10), there has been little evidence for this with the ceramic forms (3,5). There has however been little study regarding the differences in this property when the cement is used as an onlay versus an inlay. Bone ingrowth would intuitively be optimized in inlay situations when the cement was surrounded by vascularized bone, as opposed to onlay cases when the implant may be positioned on the surface of relatively sclerotic bone. Another issue not addressed in the literature is the behavior of these substances in the growing cranial vault. As these cements are frequently used as an onlay in children with residual contour defects following cranial vault remodeling, the interaction of the bone cement and host bone over time is quite relevant. This study evaluated these issues in a group of children augmented with onlay and inlay bone cement for residual contour deformities or defects following previous surgery for craniosynostosis. 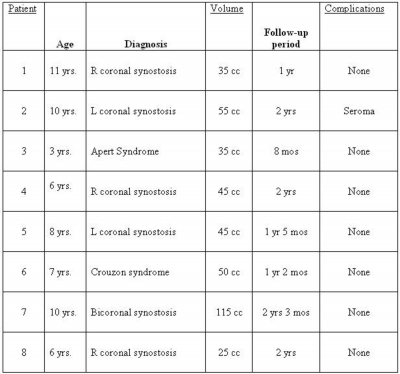 A total of eight patients undergoing cranioplasty using a hydroxyapatite bone cement (Mimix, Walter Lorenz Surgical, Jacksonville, Florida) between June 2000 and November 2001 were evaluated. All patients had previously undergone cranial vault remodelling for craniosynostoses at 9 to 12 months of age. The age range of the patients was three years to eleven years with a mean of seven and a half years of age. Five patients had a diagnosis of unicoronal synostosis, one patient bicoronal synostosis, one patient Crouzon syndrome, and one patient Apert syndrome. The bone cement was used primarily in inlay fashion in two patients and primarily as an onlay in six patients. When used as an inlay, a resorbable membrane (Lactosorb, Walter Lorenz Surgical, Jacksonville, Florida) was placed on the endocranial side of the defect to protect the hardening cement from dural pulsations. The volume of bone cement utilized ranged from 25 milliliters to 115 milliliters, with a mean of 50 milliliters. All patients were evaluated both clinically and with repeat CT scanning at the time of latest followup. Follow-up in this series ranged from eight months to twenty-seven months with a mean of nineteen months. All CT scans were obtained at the end of this follow-up. Of the eight patients included in the evaluation, only one experienced a postoperative complication. This was a ten-year-old child with a diagnosis of left coronal synostosis who on postoperative day five presented with a seroma that was resistant to two percutaneous aspirations and required open drainage and removal of the material. All patients had satisfactory cranial vault and forehead shape with only minor asymmetries noted. No patient was felt to need revisional surgery. The appearance of the bone cement and its interface with the native bone was highly variable. This variability was noted not just between patients, but also in separately treated areas in the same patient. In the two cases where the cement was used primarily as an inlay to correct full-thickness defects, there was significant fragmentation and resorption of the material in some areas (Figure 1). On clinical examination, the areas of fragmentation appeared to be solid without evidence of mobility or instability. Only in the regions with significant resorption could a defect be palpated. Figure 1: Fragmentation of the implant in a case of inlay cranioplasty. The union or interface between the bone cement and the native bone was also highly variable. In several cases, this junction was indistinguishable (Figure 2). 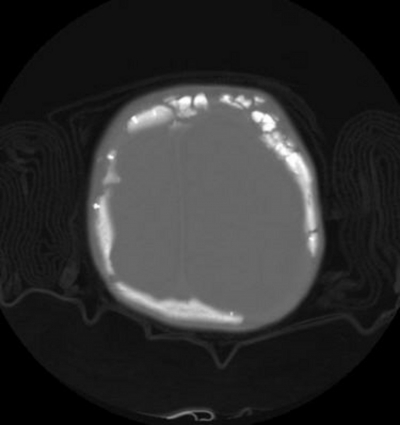 Figure 2: CT of onlay cranioplasty in which there appears to be a firm interface between the implant and the cranium. In other areas, there was a clear line of delineation between native bone and calcium phosphate cement (Figure 3). This was the case in both inlay and onlay cranioplasties in the series. In one case in which titanium screws were initially placed into the native bone and kept prominent as a post to “anchor” the calcium phosphate cement, large sections of cement were noted to have resorbed. In this case, additional cement had been layered on top of the initial layer. The most superficial component to the cement had been placed following initial hardening of the bottom layer. This most superficial cement persisted over time while the deep layer resorbed (Figure 4). 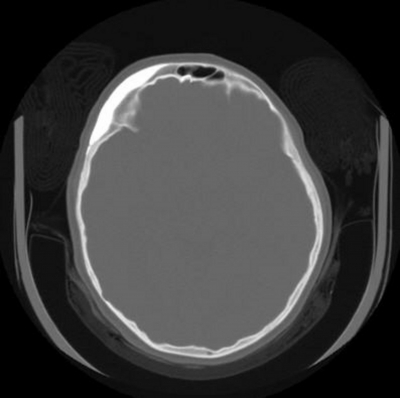 Figure 3 : CT of cranioplasty in which there is evidence of lack of the implant with the bone. Figure 4: Layered cranioplasty with resorption of the deep layer of the implant with relative preservation of the superficial component. Clinical experience with calcium phosphate bone cements has been generally favorable (1,6,7). They are well tolerated by the body but, like any synthetic material, they do not tolerate contamination well, with studies indicating a problem with infection when in communication with the sinues (6,8,9). The literature on ingrowth or replacement of the cement by bone is not as clear. With porous implants, there is evidence to suggest that significant bone ingrowth occurs when used in inlay fashion (10,11). The same evidence does not exist for microporous ceramic forms (3,5). Bone ingrowth is made even more problematic due to the situations is which these cements are often used. In either inlay or onlay cranioplasties, the host bone is often sclerotic. Unless this bone is debrided back to healthy bone, little osteoconduction should be expected. Yet another unresolved issue is the behavior of these implants in patients in whom the calvarium is still undergoing active growth. In a study evaluating inlay cranioplasties of calcium phosphate cement in immature pigs, Kirschner and colleagues demonstrated no evidence of growth disturbance (12). Similar data is lacking in the human model. In these clinical situations, it is possible that the cement may be overgrown by new bone, pushed forward by the expanding skull, or simply incorporated into the native bone. As children represent a large percentage of the patients treated using this material, this is an important issue. The results of this study address this. With respect to incorporation of the implant, in some cases there appeared to be excellent apposition between the implant and the bone, making it essentially impossible to distinguish between the two. However, in other areas, even within the same patient, there was significant lucency at the bone interface. In these areas, there was clearly no firm junction with the bone and certainly no ingrowth. 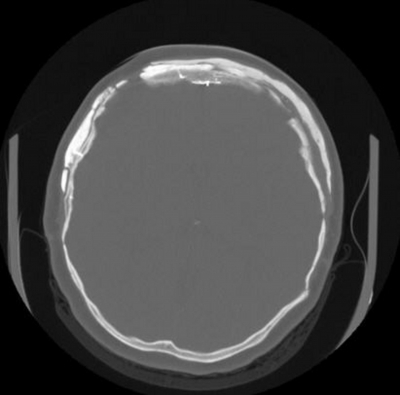 In the one case in which titanium screws were used as “anchoring posts” in the forehead over which the cement was placed, the results of the CT scan were particularly interesting. The cement that had been placed in contact with the screws resorbed, while the superficial layer was well retained. This left a dead space between the native bone and the cement (Figure 4). However, in none of the cases in which there was no firm integration between the implant and bone was there evidence of instability or mobility of the cranioplasty. In no case did native bone appear to be deposited superficial to the implant. The cement remained superficial to or at the level of the native bone in all cases. It is likely in these patients that any growth served to push the implant forward. However, the fact that all patients were three years of age or greater would indicate that the majority of cranial vault growth was complete and not a significant factor in this series. To observe any significant effect on growth on the bone would ideally require its use in a child less than 2 years of age, something most clinicians are reluctant to do given the lack of data in this population. The difference in the behavior of the cement when used as an inlay versus an onlay also deserves comment. In the two cases where the material was used primarily as an inlay for full thickness defects, there was significant fragmentation. These defects were treated by initially placing a resorbable membrane on the endocranial surface to protect the cement from dural pulsations, but the defect margins were not debrided back to bleeding bone. This may have hampered bony integration of the implant and led to long term mobility and fragmentation. It must be emphasized however that fragmentation did not correlate with palpable mobility of the implant. In areas in which the cement was used primarily as an onlay, fragmentation did not appear to be as problematic. This study raises the question as to whether or not when used in either inlay or onlay fashion, it may be preferable to burr down the outer cortex of the native bone to clearly viable bleeding bone. It is entirely possible that communication of the bone cement with viable bone may improve this interface. In these situations, it may be that there is not sufficient opportunity for the demonstrated osteoconductivity of the cement to be beneficial. Despite this variability in implant appearance radiographically, all patients maintained an acceptable remodeled cranial form following the procedure. Further experience with this material is necessary before any definitive conclusions may be drawn. 1. 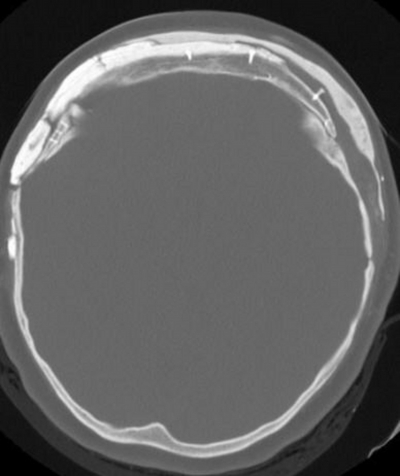 Constantino, P., Friedman, C., Jones, K. et al: Experimental hydroxyapatite cement in cranioplasty. Plastic Reconstructive Surgery 90: 174-85, 1992. 2. Constantino, P., Friedman, C., Jones, K., et al: Hydroxyapatite cement. I. Basic chemistry and histologic properties. Archives of Otolaryngology Head and Neck Surgery 117: 379-84, 1991. 3. Eppley, B.: Alloplastic implantation. Plastic Reconstructive Surgery 104:1761-1783, 1999. 4. Byrd, H., Hobar, P., Schumake, K.: Augmentation of the craniofacial skeleton with porous hydroxyapatite granules. Plastic Reconstructive Surgery 91: 15-22, 1993. 5. Constantino, P. Synthetic biomaterials for soft-tissue augmentation and replacement in the head and neck. Otolaryngol. Clin. North Am. 27, 233, 1994. 6. Baker, S., Weinzweig, J., Kirschner, R., et al: Applications of a new carbonated calcium phosphate bone cement: early experience in pediatric and adult craniofacial reconstruction. Plastic Reconstructive Surgery 109: 1789-96, 2002. 7. Friedman, C., Constantino, P. and Snyderman, C., et al: Reconstruction of frontal and frontofacial skeleton with hydroxyapatite cements. Archives Facial Plastic Surgery 2: 124-9, 2000. 8. Matic, D., Phillips, J.: A contraindication for the use of hydroxyapatite cement in the pediatric population. Plastic Reconstructive Surgery 110: 1-5, 2002. 9. Rosen, M. The response of porous hydroxyapatite to contiguous tissue infection. Plastic Reconstructive Surgery 88: 1076-80, 1991. 10. Rosen, H., McFarland, M. The biologic behavior of hydroxyapatite implanted into the maxillofacial skeleton. Plastic Reconstructive Surgery 85: 718-723, 1990. 11. Kirshner, R., Karmacharya, J., Ong, G., et al: Repair of the immature craniofacial skeleton with a calcium phosphate cement: quantitative assessment of craniofacial growth. Annals Plastic Surgery 49: 33-8, 2002. 12. Holmes, R., Hagler, H. Porous hydroxyapatite as a bone graft substitute in cranio reconstruction: a histometic study. Plastic Reconstructive Surgery 81: 612-671, 1988.